Let me start this part of the page with a brief summary of our lives. I was born in Chesterfield, Derbyshire in 1952. Within months of my birth my family moved to Newton Nr. Alfreton to be near my fathers parents. I attended Newton Infant and Primary School until 1963 when I started at Tibshelf Secondary School, I was not a scholar! and left school at 15 years old with no qualifications. I managed to find a job as an apprentice with Bowmaker (Plant) Ltd of Clay Cross some 5 miles away. Bowmakers were then the largest importers of Caterpillar plant (bulldozers etc) in the UK. Whilst employed there I attended Chesterfield College of Technology, firstly on a years full time Engineering Craft Course and thereafter, on Day Release whilst studying for my Higher National Diploma (HND) (I never completed it, although I spent 2 years on the course) but I did manage to obtain my City & Guilds Certificate Part II in Engineering. In 1970 I decided to leave my job and try my luck at something else. After being accepted for the Army (REME) and changing my mind again, I eventually joined the RAF in Sep.1970. 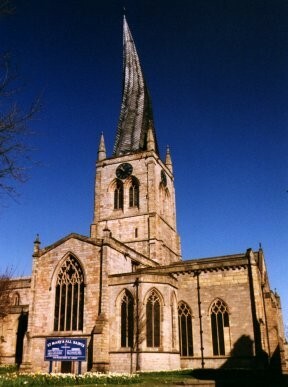 Click on the picture of St Mary's and All Saints Parish Church (The Crooked Spire) to visit Chesterfield Town Council. Eileen was born in 1949 in Oakham, Rutland. She is the youngest girl of a family of six boys and three girls!! Eileen attended the local infant and primary school, where she passed her 11+. She went on to attend Stamford High School for Girls, travelling by steam train everyday. After leaving school she was employed at Hamiltons Dentists in Oakham, where she assisted Mr Hamilton in the surgery as a Dental Nurse, she was also the Receptionist and helped out the Dental Technician. Eileen married Keith Slater, an airman at RAF Cottesmore, in 1968, they had one son, Keith Jnr. The marriage ended in divorce. Eileen and I met whilst she was the NAAFI Club Assistant Manageress at RAF Cranwell in 1979, she was then pursuing a career with NAAFI. We married in November 1980 at Sleaford Registery Office, Lincolnshire. 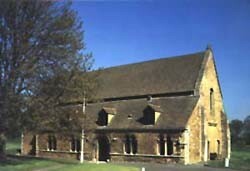 Click on the picture of the Great Hall of Oakham Castle to visit Rutland Online. Need help translating this page? use the free translation service above.